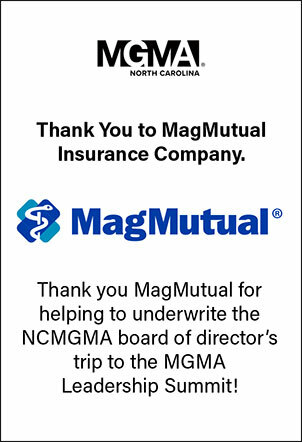 Check out the NCMGMA Fall Conference Recap! Members of the North Carolina healthcare management community came together in Charleston to connect, experience and learn at the North Carolina Medical Group Management Association (NCMGMA) Fall Conference, held October 17-19, at the Charleston Marriott. We would like to take this opportunity to thank all of our attendees, exhibitors and sponsors for supporting this event and making it the success that it is. This year, we were excited to bring in nationally-recognized speaker Britt Berrett to talk about his game-changing book Patients Come Second: Leading Change by Changing the Way You Lead, and he did not disappoint. Britt’s general sessions and breakout were very well received. “Very good speaker. Keeps the audience engaged,” and “Britt did a great job, I’d listen to him speak again,” were just a couple of the survey responses we received regarding Dr. Berrett’s session. Other highlights from the conference included the Wednesday opening session, “Peer-to-Peer Sessions: 15-Minute Management Methods,” and the Thursday in-depth interview with Dr. Mandy Cohen, Secretary of the NC Department of Health and Human Services, by professional interviewer Matt Hanis of The Business of Healthcare. “Excellent idea and would love to see more of these “short,” but incredibly relevant lessons. It’s the NCMGMA version of Ted Talks. We have a wealth of knowledge within our organization. I see this as a great way to tap in to it,” was said of the 15-Minute Management Sessions event and “This was great. I liked the interview structure,” was remarked of the Dr. Mandy Cohen session.